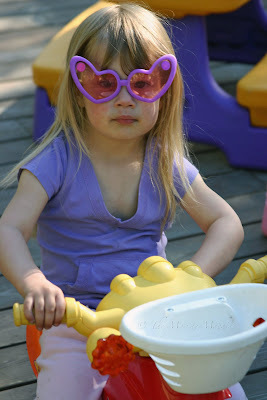 Now that she's turned three, my daughter has taken to wearing sunglasses and cruising the neighborhood on her Dora the Explorer big wheel. Watch out. Goodness, how cute is that! I love the cool, serious look on her face. Not someone to mess with, that's for sure!! The three year old intimidator! Very cool! Mine is currently cruising the neighborhood in a Honda Pilot with his brand new drivers license. I think I'll take the big wheel, anyday. I want a pair of those sunglasses! Very sassy!